15x9 6UL - Miata Turbo Forum - Boost cars, acquire cats. You guys are probably geting tired of me chasing you all over the interweb and advertising the same old tired *** wheels. So to keep the streak alive.. Most of you in the market for maximum grip hardware know about the 15x9 6UL in production and probably ordered yours already. In case you don't know, here's the rundown. * Quantity shown on website is what will be available from current run when they arrive in April (many have been pre ordered). If you are wondering about fitment READ THIS! 15x9’s on a Miata are DIY fitment, absolutely not plug and play. I will not be able to tell you precisely what needs to be done on every individual car. I can tell you that they will fit with fender massaging and if lowered at all, liner trimming/removal. Basically, you’ll have to make a little room for them. Fitment on cars other than Miatas is unknown but it's safe to say that a sawzall might be in the picture. Unflared Miatas with 225/45’s or larger will mean rolling fenders. NA’s may require slight pulling (stretching) the fenders front and rear. 205’s and a little camber might fit without any mods at all. The 275/35 Hoosier will need serious rolling and pulling and may still rub a little depending on your camber and bump travel. If you order the 15x9 6UL's, I assume you are willing to get creative, massage the car a little to solve any clearance issues that may arise. For those of you with flares, yes of course you will probably want spacers since these essentially fit the unflared fender. 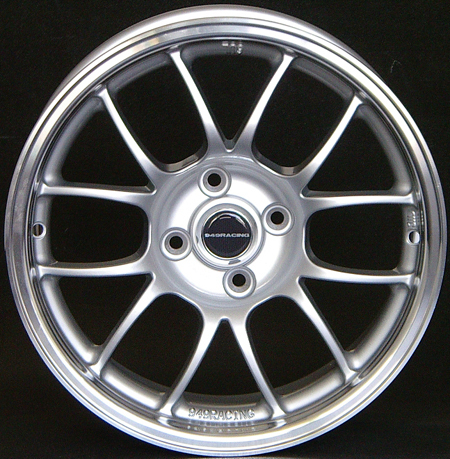 This is a limited production wheel but I will keep spares in stock after they sell out. If there is a future production run of the 15x9 6UL, it would likely be first qtr 2009. Last edited by emilio700; 01-31-2008 at 03:07 PM. damn only if you guys had better off set..... wheels look realy nice. Send a private message to what miata? Find More Posts by what miata? What do you consider a better offset? Originally Posted by what miata? if only there was a street tire in a 245 width. I mean the CR500 has "tread", but is it streetable? Not really, DOT though. The closest thing to the CR500 is maybe an A6/R6. Very thin, not much in the way of puncture resistance. Dimensionally, the CR500 is short too, 22.6 IIRC. Take a look at 225/50/15's. I used to be of the school that 225/50's were too tall. But you can still get suprising bump travel and general clearance even on an NA once you pull the liners out and roll. The 225/50 V710's I ran for a while on few cars, needed a wider wheel. There was definitely a little of the car rolling over from decrease in sidewall support but mechanical grip was higher, braking in particular. I think that is one of the main reasons I am shying away from these wheels. I like the wheels a lot, but if your implying I need to spend another 150 bucks in addition to the 900 for 4 of these.. that gets a little steep. Last edited by Newbsauce; 01-31-2008 at 03:14 PM. Just added a link to the OP to a good online tire/wheel size comparator. In any case, if you have flares, I'm guessing the final look is more important than the additional tire scrub and aero drag so spacers maybe are OK? From what I can tell about 1/4 of all the 15x9's ordered so far are going onto flared cars with spacers so apparently some people are OK with it. A bunch of other users are shoehorning the 275 Hoosier under heavily pulled stock fenders for CSP. The casting is weight/strength optimized for the minimum possible track width. You then tune with spacers just like virtually every Spec Miata and most club racers in other classes. Ultimately though, I'm selfish. I build the wheels to the spec I need for my track setup and race tires. I like the wheels a lot, but if your implying I need to spend another 150 bucks in addition to the 900 for 4 of these.. that gets a little steep. The 15x9 6UL is designed to fit under the massaged fenders of a Miata. It's not like I don't understand how to design a wheel with the right offset for flares. I simply chose not to. But that won't keep the guys with flares from seeing it from their point of view, sorry! Hey Emilio, welcome to mt.net let me take this opportunity to ask you whether you have any news about the release of your Qmax coolant reroute system. I'm facing heat issues with my engine and I'm anxiously waiting for it. Nothing new to report yet. Looks like the first ones we'll take orders for are the 1.6 and 1.8 race (non EGR) systems. EGR and the FFS versions will follow in a few weeks. First production run might sell out as there is a large Miata vendor that wants them too. If you haven't already contact Steve to get on the short list. I can't remember....how many stickers on my car does it require to receive a free set of wheels??? The guy in the red Civic is on his third magazine photo shoot with the wheels and is sporting a windshield banner now. So basically; win a few national level races, get a few hundred thousand people to see my wheels on a website homepage, in a magazine or on the cover and we'll go from there. As many Miatas as there are out there with them I'm still waiting for coverage on that first big win on the 6UL's. I'm glad you like the look of the wheel. The offset and backside setting are perfect for what they were designed for and couldn't possibly be "better" though. If I told everyone that they were perfect for flares, I agree they could most definitely be better. As it is I let everyone know my design goals and what to expect. I tried my damndest and spent a lot of time trying to make a 15x10 6UL for flares. Advertised for 11 months. In the end I couldn't sell enough in the pilot run to pay for the tooling and threw in the towel once and for all. So the 15x9 is a no compromise wheel for Miatas without flares. Got any pics, in car videos, info on your car setup? I see you have Stance coilovers. So Florida. You must know Fyrestrike and Soflarick. What kind of lap times at Homestead and Sebring? Last edited by emilio700; 02-01-2008 at 03:07 AM. BTW, these 8" ULs only weigh ~12lbs each. I run 205/50r15 Falken Azeni RT-615s. You can run 225/45r15s all day long on them including RA-1s, RS2s, NT01s and maybe a few others. You can also run 225/50r15s for a taller tire. If you really wanted to you could run 245s as well, i just can't afford them.